"Cheesy, flavorful potatoes sure to please the most-finicky eater!" Rub potatoes with olive oil and salt; pierce each several times with a fork and arrange onto a baking sheet about 6 inches apart. Bake in preheated oven until easily pierced with a fork, 50 to 60 minutes. Remove from oven and set aside to cool until cool enough to handle, keeping oven heat at 425 degrees F (220 degrees C). Halve potatoes lengthwise and scoop potato from each half into a bowl, leaving about 1/4 inch of the potato attached to the skin all the way around. Melt butter in a large saucepan over medium-high heat. Saute garlic in butter until fragrant, 1 to 2 minutes. Stir scooped potato, Monterey Jack cheese, sour cream, and most of the green onion together with the garlic and butter; cook and stir the mixture until heated and smooth, about 5 minutes. 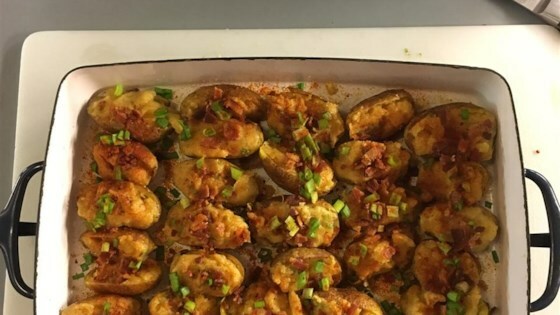 Scoop the potato mixture into the potato skins and arrange onto the baking sheet. Bake in oven until heated through, 15 to 20 minutes. Garnish with remaining green onion, bacon, and paprika. See how to make super-simple cheesy potato casserole. After all ingredients are added to saucepan, you can also heat thoroughly on stove top stirring continuously so as to not burn. This will shorten the final bake time. I've made this twice now for two different parties, and am making it again tonight for New Year's Eve. It's been a huge hit every time! For parties I make it with smaller "two bite" potatoes. Very easy and tasty. I made mine in the microwave. They came out great. Easy and tasty. Even my picky son loved it. Good flavor but a little drier than what I prefer. Very good. I used more bacon that the recipe calls for. Everyone loved them! I did low dairy, so I added coconut yogurt instead of sour cream, and they were still pretty awesome.